“This is all about quality,” said Lindy White, CEO of Ballad Kingsport, which includes HVMC and Indian Path Medical Center. Hospitals were scored in key value-based performance areas: risk-adjusted mortality, risk-adjusted complications, percentage of coronary bypass patients with internal mammary artery use, 30-day mortality rates, 30-day readmission rates, severity-adjusted average length of stay, wage- and severity-adjusted average cost per case and, new this year, CMS 30-day episode payment measures. HVMC offers a wide array of highly sophisticated cardiac services and procedures, with robust technology and a large staff of specialized physicians and team members who are well-equipped to care for cardiac patients. “One of the first benefits is the team at Holston Valley is recognized as a high-functioning, safe and involved team,” Dr. Herb Ladley, a cardiologist and HVMC’s chief medical officer, told reporters Wednesday before viewing a heart value replacement procedure. Ladley said that HVMC is among teaching hospitals without a cardiac fellowship that earned the award. Fifteen others with a fellowship received the honor, while 20 non-teaching hospitals got it. He said the award is a reflection on employees from doctors and nurses to technicians and janitors. 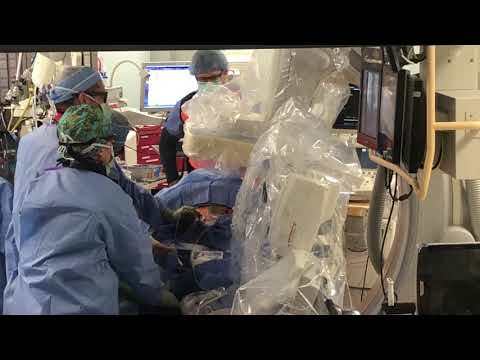 The hospital allowed reporters to photograph and video a live aortic heart value replacement procedure, more technically called a transcatheter aortic valve replacement, using a relatively new type of valve, which was introduced in two patients in leg arteries but can be done through the neck and other locations. Two patients in their 80s were among the three served Wednesday in the 90-minute procedure, after which patients return home the next day, compared to four-hour open heart surgery that can take patients days to recuperate. Ladley said within a few months, patients from morning procedures will be able to go home the same day. 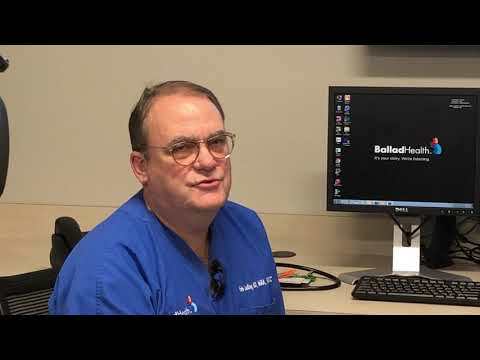 He said the procedure, also done in Knoxville and the University of Virginia hospitals, was not considered in the award but shows the excellence of HVMC in cardiac dare. It generally is done in older patients with calcium buildup around the aortic heart valve. “It’s like a door that’s stuck on its hinges,” Ladley said. Symptoms often include fatigue and fainting, he said. — Become a leader in cardiovascular research and training status, with annual visits from Harvard fellows who come to learn the techniques offered by Holston Valley’s prominent cardiologists. According to IBM Watson, if all cardiovascular providers in the U.S. performed at the level of this year’s winners (based on Medicare patients only), results industry-wide could amount to more than 10,300 additional lives saved, $1.8 billion saved, and 2,800 additional bypass and angioplasty patients could be complication-free. For more information, go online to www.100tophospitals.com.